The State Russian Museum (formerly the Russian Museum of His Imperial Majesty Alexander III, while prior to that, as the Palace of the Grand Duchess Elena Pavlovna) is the largest depository of the Russian fine art in St Petersburg. 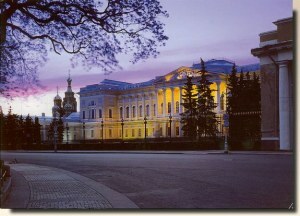 The museum was established on April 13, 1895, upon enthronement of Nicholas II to commemorate his father, Alexander III. Its original collection was composed of artworks taken from the Hermitage Museum, Alexander Palace, and the Imperial Academy of Arts. After the Russian Revolution of 1917, many private collections were nationalized and relocated to the Russian Museum. These included Kazimir Malevich's Black Square.